Kirstiekins Blogs: MY NEW MUG IS AWESOME!!! MY NEW MUG IS AWESOME!!! I have discovered something new and awesome! No it's not my amazing new Kath Kidston mug, but it should be! I treated myself to a new mug, because if you haven't heard... I'm sick. I am a massive fan of Kath Kidston, I have actually been told that I have a problem as I pretty much want to own everything!! 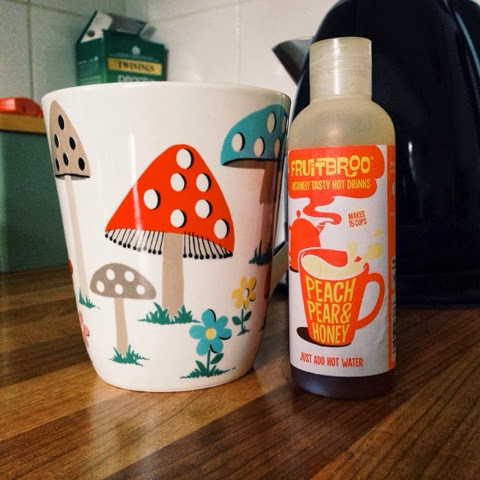 I was in the middle of having an argument in mind about whether to get a green tea or a chamomile when I came across this cool little bottle called 'fruitbroo'. It's like honey but not, it's fruity goo stuff in a bottle, which is given away by the name and all you do is add boiling water! Okay, so it's not technically tea but I found it in the tea section! And I have to admit that it is really awesome! I suppose you could even mix it into existing tea flavours and create something cool and new for yourself! I was really skeptical when I first made it, I didn't know if the teaspoon of goo that it suggested was going you be enough or too much, but it was! The flavour remained the same throughout, it didn't go all watery and bland towards the end like most teas! So in conclusion, go buy this fruitbroo from the tea isle and then let me know what you think. And also in even more of a conclusion... MY MUG IS THE BEST! !